Only 12 left! This item ships in 1-2 days. Your new Grandparents, Aunt and Uncle will love receiving their very own Personalized New Baby Photo Frame to show off their new, little grandchild, niece or nephew. 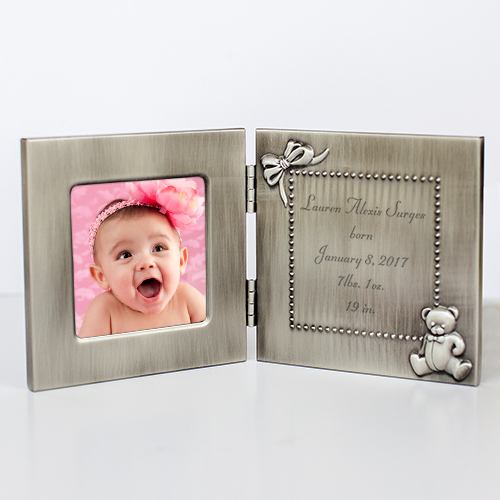 Our Engraved New Baby Silver Photo Frame measuring 5" x 5" holds a 3" x 3" photo. 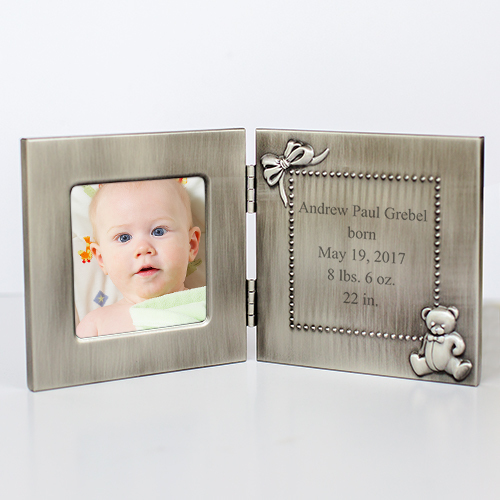 Engraved new baby photo frame includes FREE engraving! Engrave your New Baby Photo Frame with any new baby's name, birth date, weight, height and inches. For your new baby gift please choose Block or Script writing. Our baby frames make for wonderful newborn gifts! Silver Photo Frame measuring 5" x 5"
Beautiful personalized photo frame! Good quality. Very happy with this purchase. The script is beautiful! The frame is very nice. Just what I had in mind! The recipient absolutely LOVED this gift! It is a fantastic gift priced very well. If your looking for new baby gift ideas, then you have come to the right place. Browse through our large selection of Personalized Baby Gifts to find unique ideas for Baby's First Birthday and more.